1. I chaired the ASEAN Foreign Ministers’ Retreat on 17-18 January 2019 in Chiang Mai. 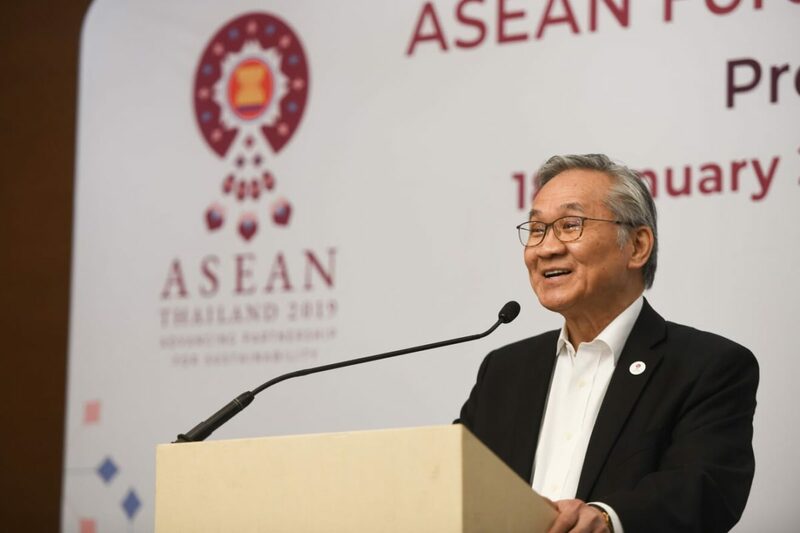 The Retreat is the first gathering of the ASEAN Foreign Ministers under Thailand’s ASEAN Chairmanship in 2019 with the theme, “Advancing Partnership for Sustainability”, which the Foreign Ministers welcomed. 2. We had fruitful discussions on ASEAN’s priorities for the year ahead, as well as exchange of views on regional and international developments. We discussed the way forward for ASEAN Community-building, the strengthening of ASEAN partnerships with external partners and the international community, and the reinforcing of the ASEAN-centred regional architecture. We underscored the importance of implementing effectively the ASEAN Community Vision 2025 and its various Blueprints, as well as ASEAN agreements in force in order to maintain strong momentum in building a people-centred ASEAN Community that leaves no one behind, and looks to the future. As the Asia-Pacific continues to witness continued change and uncertainty, we believed that ASEAN needs to not only maintain its unity and centrality but also enhance ASEAN’s strategic value added, in order to remain a driving force for key developments in our region. 3. We reaffirmed our shared commitment to maintaining and promoting peace, security and stability in the region, as well as to the peaceful resolution of disputes, including full respect for legal and diplomatic processes, without resorting to the threat or use of force, in accordance with the universally recognised principles of international law, including the 1982 United Nations Convention on the Law of the Sea (UNCLOS). 4. In view of ASEAN’s interdependence with the international community and the fact that over 70 percent of ASEAN’s trade is with the rest of the world, we agreed to further enhance ASEAN’s external relations, including the newly established ASEAN-Russia Strategic Partnership, and agreed in principle to upgrade ASEAN-EU relations to a Strategic Partnership, subject to further details and timing to be worked out. We also stressed the need to reinforce further the ASEAN-centred regional architecture so that it would be able to more effectively respond to challenges to regional peace and stability. 5. We looked forward to the ASEAN-Republic of Korea (ROK) Commemorative Summit to commemorate 30 years of ASEAN-ROK Dialogue Relations and tasked our officials to begin working on the preparations for this event, including substantive outcomes to further enhance this Strategic Partnership. 6. We reaffirmed the validity, relevance and importance of the Treaty of Amity and Cooperation in Southeast Asia in the current geo-political context. The TAC continues to serve as the key code of conduct governing inter-state relations in the region and a foundation for the maintenance of regional peace and stability. We are therefore committed to further promoting the purposes and principles of TAC and welcomed the interest of Peru to accede to the TAC on the basis of respect for and conformity with the purposes and principles of the TAC. 7. I briefed the Foreign Ministers on Thailand’s priorities and initiatives under our Chairmanship theme of “Advancing Partnership for Sustainability”. The Ministers discussed and expressed their support for Thailand’s Chairmanship and its theme. 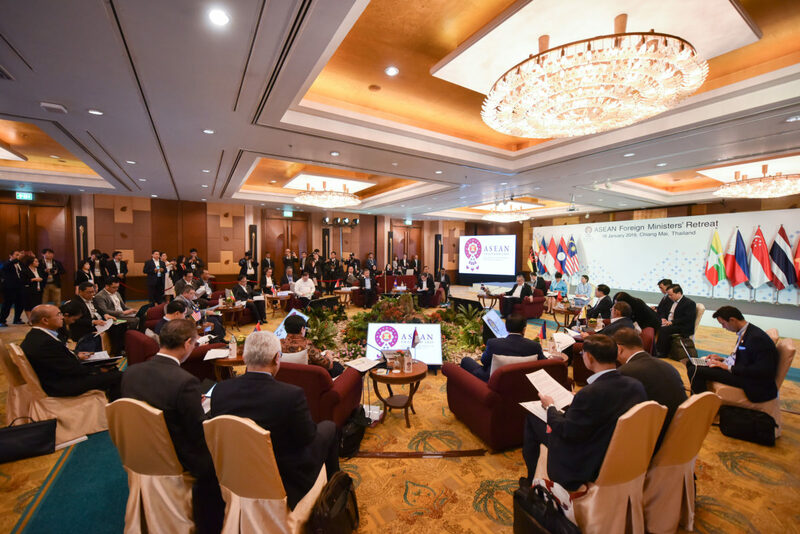 The Ministers underlined the need for ASEAN to focus on policies that are sustainable, enhance coordination across sectoral bodies, as well as address long-standing issues that have affected ASEAN Community building. The Meeting recognised that sustainable development cooperation was a strategic priority of ASEAN and the key to promoting sustainability in the region. ASEAN also needed to be future-oriented and better prepared for the future by making use of technological advances from the Fourth Industrial Revolution, while building immunities against disruptive technologies. In this connection, we welcomed the Secretary-General of ASEAN’s initiative in issuing a report regarding the effects of the Fourth Industrial Revolution on ASEAN which is being studied by our economic counterparts and looked forward to the ASEAN Secretariat’s assessment on the preparedness and implications of the Fourth Industrial Revolution from a holistic perspective considering political-security and socio-cultural aspects as well as the cross-pillar implications. Meanwhile, it is also noted that the Economic Research Institute for ASEAN and East Asia (ERIA) has issued a report on ASEAN 2040. 8. We emphasised the importance of enhancing regional connectivity and reaffirmed our commitment to implementing the MPAC 2025. We recognised the importance and value of building on connectivity strategies at the sub-regional level and enhancing connectivity between ASEAN and other regions by connecting the connectivities. We therefore supported efforts to promote greater synergies between MPAC 2025 and other connectivity strategies to help realise a seamless ASEAN. We also underscored the need to ensure sufficient funding for infrastructure projects in the region through resource mobilisation and cooperation with Dialogue Partners, external partners and international institutions. 9. We were pleased with the progress in the implementation of the IAI Work Plan III (2016-2020) to support CLMV countries in meeting ASEAN-wide targets and in narrowing development gaps within ASEAN. We recognised the need to continue to mobilise resources, along with those of ASEAN’s partners, including international organisations and the private sector, to implement the Work Plan in a timely and effective manner. 10. We recognised the need to have a comprehensive approach to addressing transnational crimes which have accompanied enhanced regional connectivity. In this regard, we would work toward strengthening our cooperation on border management to safeguard our region while facilitating cross-border trade and movement of people. 11. We agreed to support efforts to realise the ASEAN Single Window this year to facilitate cross-border trade. We recognised the importance of giving strong political impetus to RCEP negotiations which will generate benefits to the region, and support ongoing efforts to conclude a modern, comprehensive, high quality and mutually beneficial RCEP this year. We reaffirmed our commitment to uphold a global trade environment that is open, mutually beneficial, rules-based and inclusive through the RCEP. 12. We recognised the importance of enhancing cybersecurity cooperation and enhancing capacity of ASEAN experts in cyber incidence response and analysis to build a safe, secure and resilient cyberspace supporting the digital economy of the region. We therefore welcomed the operationalisation of the ASEAN-Japan Cybersecurity Capacity Building Centre (AJCCBC) in Bangkok, as well as the announcement of the ASEAN-Singapore Cybersecurity Centre of Excellence, and looked forward to the Centres’ cybersecurity activities and training programmes contributing to this goal. We reiterated the importance of improving coordination in cybersecurity policies and capacity building in ASEAN. 13. We reaffirmed our commitment to promoting complementarity between the ASEAN Community Vision 2025 and the United Nations 2030 Agenda for Sustainable Development to build a sustainable ASEAN Community. In this regard, we looked forward to the 3rd High-Level Brainstorming Dialogue on Enhancing Complementarities between the ASEAN Community Vision 2025 and the UN 2030 Agenda for Sustainable Development to be held on 29 March 2019 in Bangkok. We also looked forward to the launch of the ASEAN Centre for Sustainable Development Studies and Dialogue (ACSDSD) in Thailand this year to promote sustainable development and cooperation through concrete projects with partners. We also noted the convening of key meetings in Thailand that would promote sustainability in our region, including the Special ASEAN Ministerial Meeting on Marine Debris in March, the ASEAN High Level Meeting on Human Capital Development in April and an inception workshop on combatting IUU fishing in April. 14. We considered and approved the Priority Programmes/Activities of the ASEAN Intergovernmental Commission on Human Rights (AICHR) 2019 and Budget. 15. We agreed to promote greater public awareness of ASEAN as well as strengthen and broaden grassroots support for the ASEAN Community within our respective countries. In this regard, we believed that a Network of ASEAN Associations of ASEAN Member States would facilitate ASEAN Member States in sharing best practices and working together to promote ASEAN awareness and a sense of the ASEAN Community and identity, and tasked our Senior Officials to help operationalise this. We looked forward to the next edition of the ASEAN Prize to be presented at the 34th ASEAN Summit in Thailand. We also welcomed the designation of 2019 as the ASEAN Cultural Year to promote ASEAN culture globally and to foster ASEAN identity. 16. We received a briefing from Myanmar on the humanitarian situation in Rakhine State and had a fruitful discussion on the issue where we agreed on the importance of ASEAN’s role. As a follow-up to our discussions immediately before the 33rd ASEAN Summit, we welcomed the TOR of the Needs Assessment Team which was endorsed at the first High-Level Strategic Coordination Meeting during the visit of the ASEAN Secretary-General to Myanmar on 16-18 December 2018. We also welcomed the ASEAN Secretary-General’s facilitating role to ensure close coordination on the Needs Assessment Mission within ASEAN. 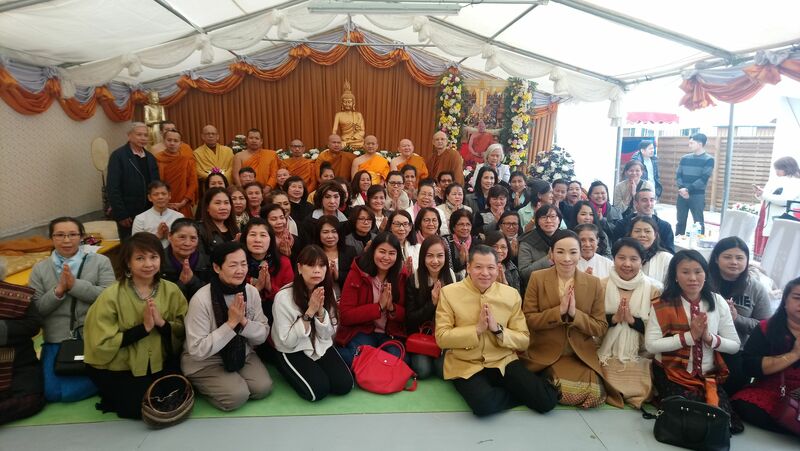 We endorsed the sending of the Needs Assessment Mission of the AHA Centre to Myanmar to support the Myanmar Government in its repatriation process and hoped that it would take place as soon as possible. We also agreed to compile information regarding the cooperation and assistance voluntarily extended by ASEAN Member States to Myanmar to address the humanitarian situation and promote sustainable development. 17. We expressed our continued support for Myanmar’s humanitarian relief programme in Rakhine State and, its commitment to ensure safety and security for all communities in Rakhine State as effectively as possible and facilitate the voluntary return of displaced persons in a safe, secure and dignified manner. We looked forward to the full implementation of the MOU between Myanmar Government, the Office of the United Nations High Commissioner for Refugees (UNHCR) and United Nations Development Programme (UNDP) to facilitate the repatriation process of displaced persons from Rakhine State. We stressed the need to find a comprehensive and durable solution to address the root causes of the conflict and to create a conducive environment so that the affected communities can rebuild their lives. We encouraged Myanmar to continue to implement the remaining recommendations of the final report of the Advisory Commission on Rakhine State. We expect that the Independent Commission of Enquiry established by the Government of Myanmar would seek accountability by carrying out an independent and impartial investigation into alleged human rights violations and related issues. We also reaffirmed ASEAN’s support for Myanmar’s efforts to bring peace, stability, the rule of law, to promote harmony and reconciliation among the various communities as well as to ensure sustainable and equitable development in Rakhine State. 18. We reaffirmed the importance of maintaining and promoting peace, security, stability, safety and freedom of navigation in and overflight above the South China Sea and recognised the benefits of having the South China Sea as a sea of peace, stability and prosperity. We underscored the importance of the full and effective implementation of the 2002 Declaration on the Conduct of Parties in the South China Sea (DOC) in its entirety. We warmly welcomed the continued improving cooperation between ASEAN and China and were encouraged by the progress of the substantive negotiations towards the early conclusion of an effective Code of Conduct in the South China Sea (COC) on a mutually-agreed timeline. We noted that ASEAN Member States and China had agreed on a Single Draft COC Negotiating Text and looked forward to the completion of the first reading of the Single Draft COC Negotiating Text by 2019, as announced at the 21st ASEAN-China Summit in Singapore in November 2018. In this regard, we emphasised the need to maintain an environment conducive to the COC negotiations. We welcomed practical measures that could reduce tensions, and the risk of accidents, misunderstanding and miscalculation. We stressed the importance of undertaking confidence building and preventive measures to enhance, among others, trust and confidence amongst parties. 19. We discussed the matters relating to the South China Sea and took note of some concerns on the land reclamations and activities in the area. We reaffirmed the need to enhance mutual trust and confidence, exercise self-restraint in the conduct of activities and avoid actions that may further complicate the situation, and pursue peaceful resolution of disputes in accordance with international law, including the 1982 UNCLOS. We emphasised the importance of non-militarisation and self-restraint in the conduct of all activities by claimants and all other states, including those mentioned in the DOC that could further complicate the situation and escalate tensions in the South China Sea. 20. We welcomed the recent positive developments on the Korean Peninsula and urge all concerned parties to continue working towards the realisation of lasting peace and stability on a denuclearised Korean Peninsula, including through the full and expeditious implementation of the Panmunjom Declaration, the Pyongyang Joint Declaration and the Joint Statement by the US and DPRK leaders. We welcomed the initiatives and efforts by the ROK, the United States and China to promote dialogue with the DPRK and the DPRK’s stated commitment to complete denuclearisation and its pledge to refrain from further nuclear and missile tests. We reiterated our commitment to the full implementation of all relevant United Nations Security Council Resolutions and noted international efforts to bring about the complete, verifiable and irreversible denuclearisation of the Korean Peninsula which will contribute to peace and stability in the region. 21. We discussed the need to strengthen efforts to counter terrorism and violent extremism, and in this regard, expressed continued support for the activities of Southeast Asia Regional Centre for Counter-Terrorism (SEARCCT), including capacity-building programmes, joint research projects and related events. 22. We noted the progress of the deliberation on the ASEAN collective approach on the Indo-Pacific Outlook that reinforces ASEAN centrality and that is based on key principles of openness, transparency, inclusiveness, rules-based approach, mutual trust, mutual respect and mutual benefit. We believe that such an approach would generate concrete benefits for the peoples of the region and complement existing regional and sub-regional frameworks of cooperation. In this regard, we looked forward to further development of this Outlook, with a view to finalising it for adoption by ASEAN.